3/30/2017 VisANT server will undergo regular maintenance on 9am Monday, April 3, 2017. We expect that the maintenance will be finished in one hour. 12/23/2016 Release of VisANT 5.51 to fix some bugs. 02/24/2016 Databse maintenance was finished and system is back to normal now. 11/06/2015 Release of VisANT 5.37 with some bug fixing, especially the URL launching problem in Linux/Unix and Mac OS. VisANT 5.37 requires Java 1.6+ to run. 04/22/2015 VisAnt.jar is now signed to make it easier to run as online Applet with the latest JRE and browser. Here is the detailed Instructions for the browser settings in different OS. 03/18/2015 VisANT migration finished, please feel free to let us know if you experience any other problems. 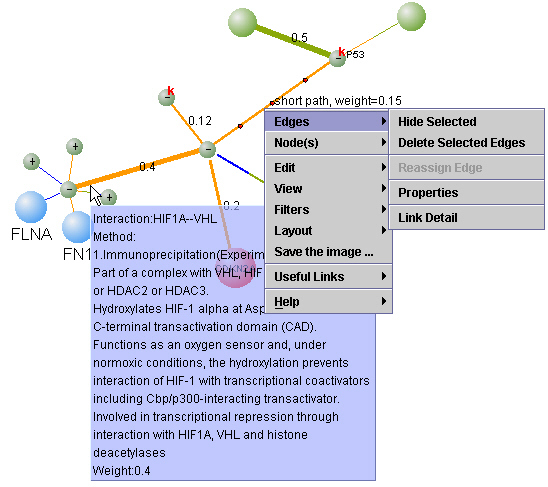 03/17/2015 User manual for the visualization of metabolic network is updated. 03/13/2015 Release of VisANT 5.16 with enhanced edge-list format to support the specification of the node types and bug fixing. 08/29/2014 Release of VisANT 4.19 with beta release of MBL plugin available under Layout menu that supports the network layout inside the metanodes. Convenient and fast network/pathway construction using either update-to-date knowledge or user's data, more ..
VisANT project is partially supported by funds from National Institutes of Health (R01GM103502-05, 1R01RR022971-01A1 and 1R21CA135882-01).